One of the world’s largest dry docks has sunk on October 29 in a shipyard in the far northwest part of Russia after a power supply disruption with Russia’s sole aircraft carrier, the Admiral Kuznetsov, aboard. The floating dry dock reportedly sank the moment the Admiral Kuznetsov was being pulled out out after the failure of a pump system. As a result of the sinking of the Swedish-made PD-50 drydock, which took place at the 82nd Repair Shipyard in Roslyakovo district near Severodvinsk overnight on Tuesday, a crane collapsed on the carrier’s deck leaving a hole above the waterline that measures 4 by 5 meters, according to Russian media reports. “The crane that fell left a hole 4 by 5 meters. But at the same time […] these are structures that are repaired easily and quickly,” the head of Russia’s United Shipbuilding Corporation (USC), Alexei Rakhamnov, was quoted as saying. 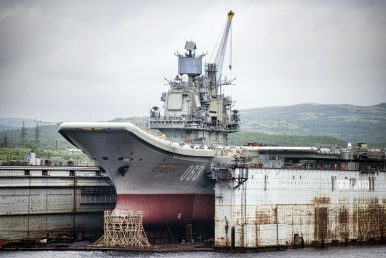 Rakhamnov also added that the accident would not impact the repair and modernization work on the carrier, which is expected to take two and a half years, with the Admiral Kuznetsov slated to return to active duty in 2021. Rakhmanov’s comments should be taken with a grain of salt. Even prior to the accident, naval analysts believe that the carrier will be sidelined for a much longer time period. Notably, Russia also has a history of covering up or downplaying accidents during overhauls. A contract between the Russian Ministry of Defense and USC for the modernization of the carrier was only signed in June. Prior to the signing, USC insisted that the work on the carrier could not be finished under four years. While Russian media initially did not report about any casualties, TASS news agency notes in an October 30 article that four workers suffered hypothermia and were taken to hospital with one of the workers also suffering from a stomach injury. There is also one person still missing. The carrier has been towed to another repair yard, according to Sputnik News. Severodvinsk shipyard reportedly possesses another floating dock, PD-1, of approximately identical size to the one sunk where work on the carrier can be continued. A Russian defense industry source told TASS that it will six to 12 months to recover the sunken floating dry dock, although this would not be possible without international support as Russia currently does not possess the equipment to lift a drydock of such size from the seabed. The Admiral Kuznetsov was commissioned in 1990, however, it spent most of its service life in port. The carrier last underwent a two-year refit between 1996 and 1998. The Russian Navy’s 55,000-ton flagship has never been deployed for longer than six months and has famously been followed by an oceangoing tug boat during all of its sea voyages due to the carrier’s poor endurance.